Wide-Field Planetary Camera 2 (WFPC2) on display under a full scale model of the Hubble Space Telescope. WASHINGTON - The camera that captured many of the Hubble SpaceTelescope's most famous images and the "contact lenses" thatfocused the observatory's flawed mirror debuted Wednesday at theSmithsonian's National Air and Space Museum in Washington, D.C. along withthe first phase of a new interactive gallery devoted to humans living andworking in space. "Moving Beyond Earth,"which replaces the prior Rocketry and Space Flight gallery that originallyopened just before the start of the space shuttle era in 1979, seeksto tell the story of the U.S. Space Transportation System (STS, the originalname of the shuttle system) and the accompanying efforts to build a spacestation with an approach mimicking NASA's own history. "The gallery is in its first stage," explainedcurator Valerie Neal. "What you see here today is essentially afootprint for what will be a fully built-out gallery in the next twoyears. We are approaching this incrementally, just as NASA approached the InternationalSpace Station. We are not doing it all at once, we're phasing itin, element by element." Currently on display are mostly space shuttle artifacts anddisplays that were previously exhibited in other galleries, accompaniedby state-of-the-art touch-screen and button-enabled interactivesdesigned to engage a new generation of visitors. "We were very sparse on artifacts," Neal said duringa press preview. "The artifacts forthe space shuttle era were all in use. NASA has been reusing andrecycling and holding close everything needed. Thus artifacts are now justabout to begin to be released. The ability for us to display theHubble artifacts is a signal of that availability." The artifacts on display reflect the exhibition's three mainthemes: Moving into Space, Living and Working in Space, and Envisioningour Future in Space. "Moving Into Space is where we deal with the challengesand choices involved in the quest to establish routine and reliable,economical and safe transportation into space," Neal described. "The signature artifact being of course the space shuttle, represented bya large model." The 12-foot 1/24-scale shuttle model was moved from theneighboring Space Race gallery, where it stood next to the full-sizeengineering model of the Hubble Telescope. 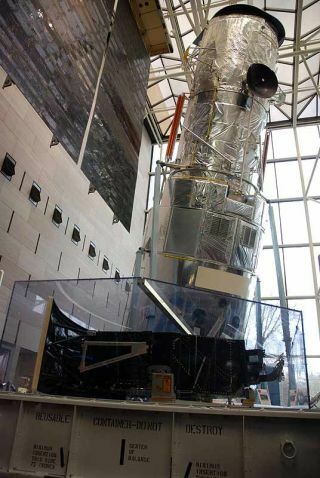 Its replacement is the 619-pound,3-foot-by-7-foot Wide-Field Planetary Camera 2 (WFPC2), which itself wasreplaced aboard the Hubble after 16 years of capturing many,if not most of the observatory's famous images. "The next section deals with Living and Working inSpace and the challenges of making a home in space, where microgravitygives us both an opportunity, particularly an opportunity for doingscientific research, but it is also a hazard," continued Neal. "One significant portion of that part of the exhibitionis extravehicular activity for spaceflight. The spacewalks onthe servicing missions to the Hubble Space Telescope were quintessential spacewalks;they tasked humans to the utmost to do highly-precise work in space underpretty grueling circumstances." "We will be highlighting the Hubble servicing missionsin the fully [decked] out gallery but COSTAR and also the Power ControlUnit trainer in the corner here hold the footprint for that section,as does the International Space Station model above," said Neal,referencing the Hubble's Corrective Optics Space Telescope AxialReplacement on display alongside a mockup of the observatory's electricalnerve center that was used to train astronauts. The Hubble instruments will be on display throughmid-December. They then will travel to southern California to go ontemporary exhibit at several venues. In March 2010, the instrumentswill return to the Air and Space Museum, where they will take up permanentresidency. Moving further around the room, visitors find the RussianSokol pressure suit worn by space tourist Dennis Tito and a model ofNASA's proposed Ares launch vehicle. "Our third section, Envisioning ourFuture in Space, will be looking at the questions, challenges andchoices ahead for planning a human future in space," said Neal. "What is the mix between commercial spaceflight and government-sponsoredspaceflight? What is the mix between human and robotic presences? What isthe mix between science and just basic travel and exploration? All of thatis yet to come." Much of the room's contents are yet to come, too, but thegallery in its present phase is not empty. Walking through the gallery, visitors find themselves"in orbit" by an expansive rotating view of the Earth thatdrifts over one gallery wall, while a fly-around tour of the space stationfills another. "Also holding the footprints for the first stage are aseries of interactives that are loaded with content that is keyed tothe artifacts and the exhibition," Neal described. Among the computer-powered challenges are: SpaceflightAcademy, a multi-player trivia game; Be A Flight Director, where usersmake decisions based on a real shuttle flight; Design It!, using aflat table touch-screen to build a space station; and Space ForYou?, identifying potential careers in space based on a user'sprofile. "[These have been] called artifacts, which is kind ofan odd term; these are instruments that I trained for years to work withand to take out and to bring back, so to me they are very much alive,not artifacts," said astronaut John Grunsfeld, whose five flightsonboard the shuttle included three visits to the Hubble SpaceTelescope. Grunsfeld, who was on hand at the museum for the debut ofthe gallery and the Hubble instruments-turned-artifacts, drew parallelsbetween the exhibit and the missions it was designed to represent. "The wonderful thing about the Hubble Space Telescopeand also this gallery, which is different from many parts of the NationalAir and Space Museum, is that the Hubble story is still continuing,even though we have some items back," he explained. "It is also the story of the International SpaceStation. We have a crew on Atlantis now, six crew members went up onMonday, and there are six crew members onboard [the station], so thatis an active story, so keep in mind when you look at the graphics [in thegallery] that there are people living and working in space, 365/24/7.So this gallery will also be part of that living story." "As we push out of low Earth orbit, hopefully we willgo and do some incredible things that will be both exciting andinnovative, those will too, be part of this gallery and maybe some ofthe kids who come in and work with the Spaceflight Academy and pretend tobe flight directors will be part of that story." "So I am looking forward to the future exhibitshere," said Grunsfeld. Viewmore photographs from "Moving Beyond Earth" at collectSPACE.com.